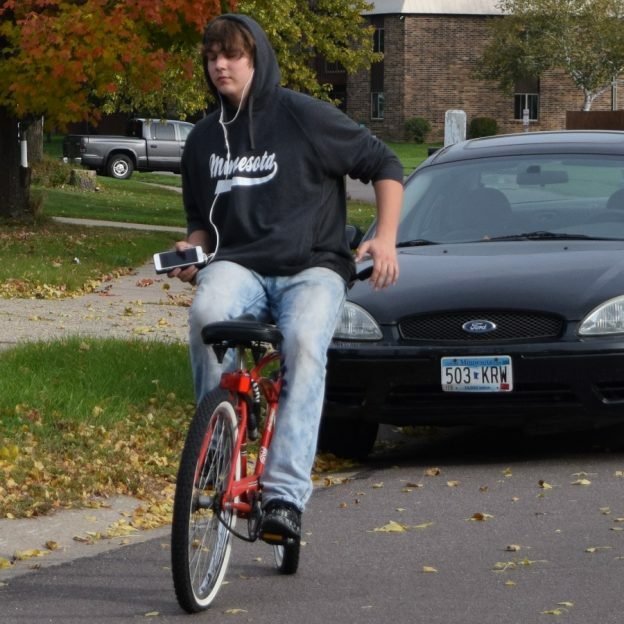 Things not to do while biking on #Wise Wednesday or any other day of the week. Here in this photo we caught a young lad turned around doing everything he shouldn’t do, making his bicycle ride unsafe (the rider is OK, he did miss the car!). 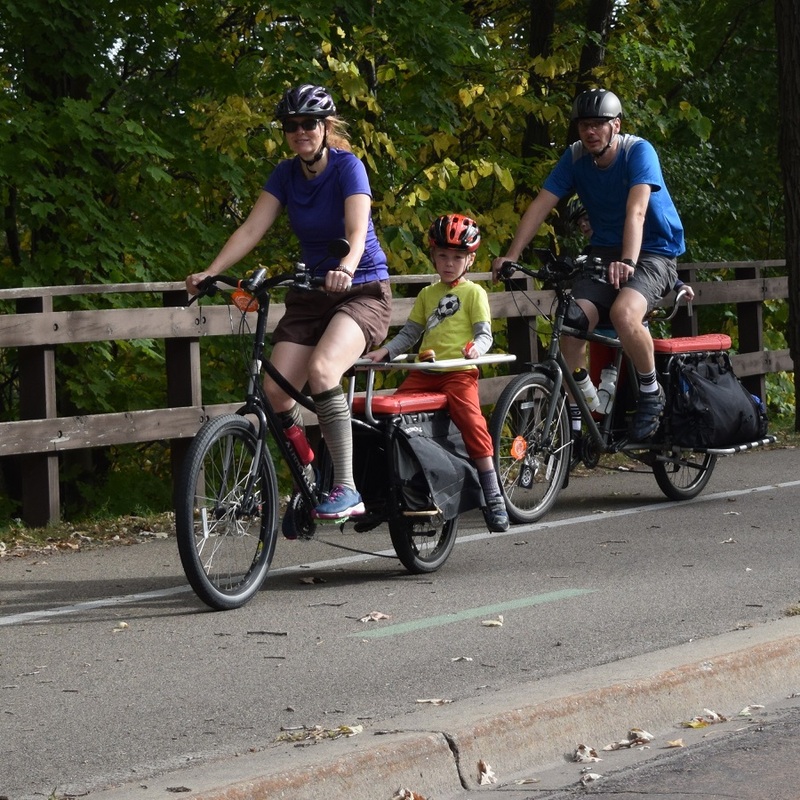 With the leaves turning and perfect weather biking weather we hope you get out on your bike and enjoy a fall riding possibilities in Minnesota. 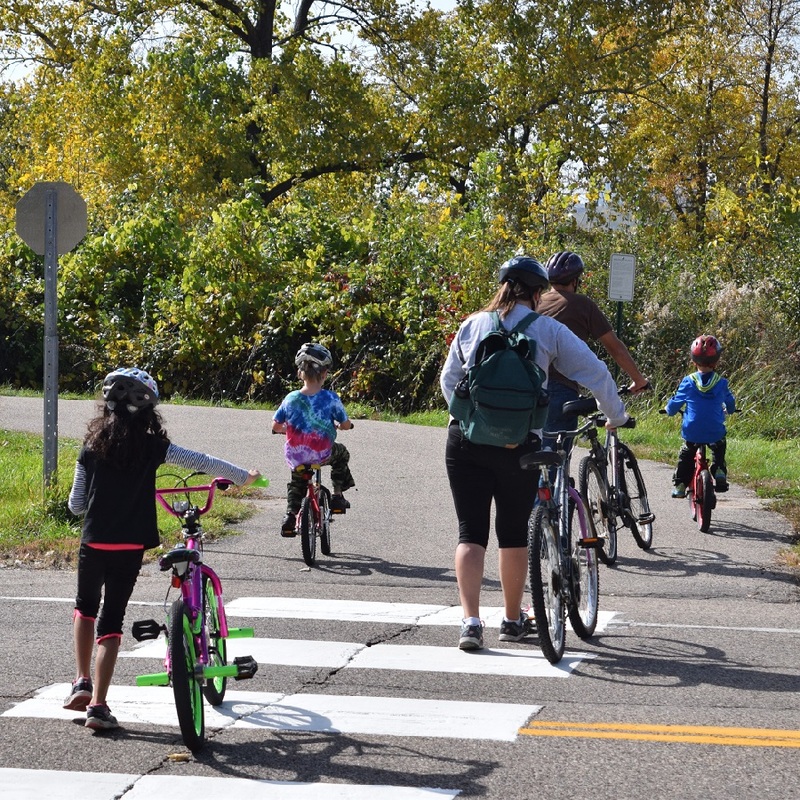 See all the bike friendly places to explore in the new Minnesota Bike/Hike Guide. Thanks for viewing the Wise Wednesday Bike Pic of the Day. 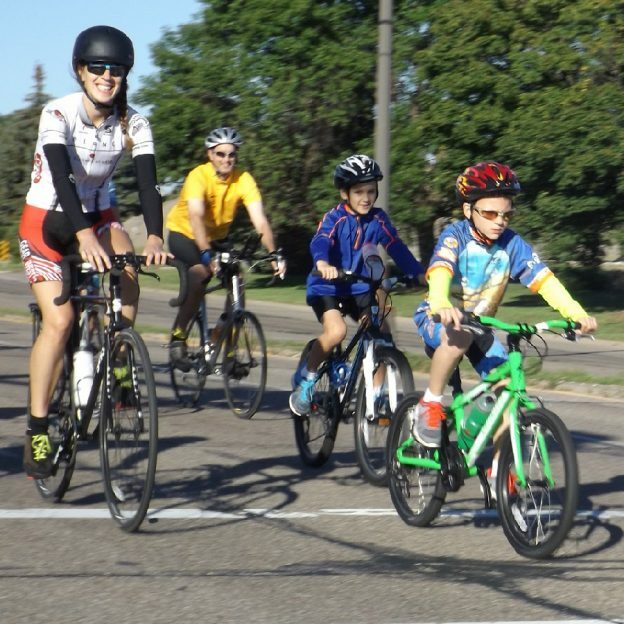 This entry was posted in News, Picture of the Day and tagged #nextbikeadventure, #ridesafe, #wisebikewednesday, #wisewednesday, bicycle safety, BikeMN, Minnesota, Minnesota bike maps, Minnesota bike safety, Minnesota safety council, Ride safe on October 12, 2016 by Russ Lowthian. 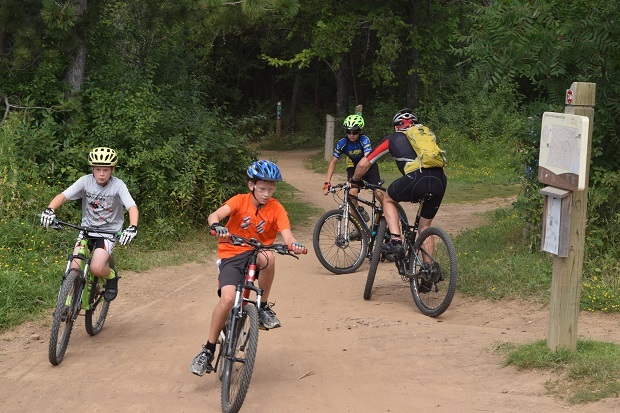 A little bit of traffic congestion near a local Minnesota mountain bike trail head, as everyone is having fun. 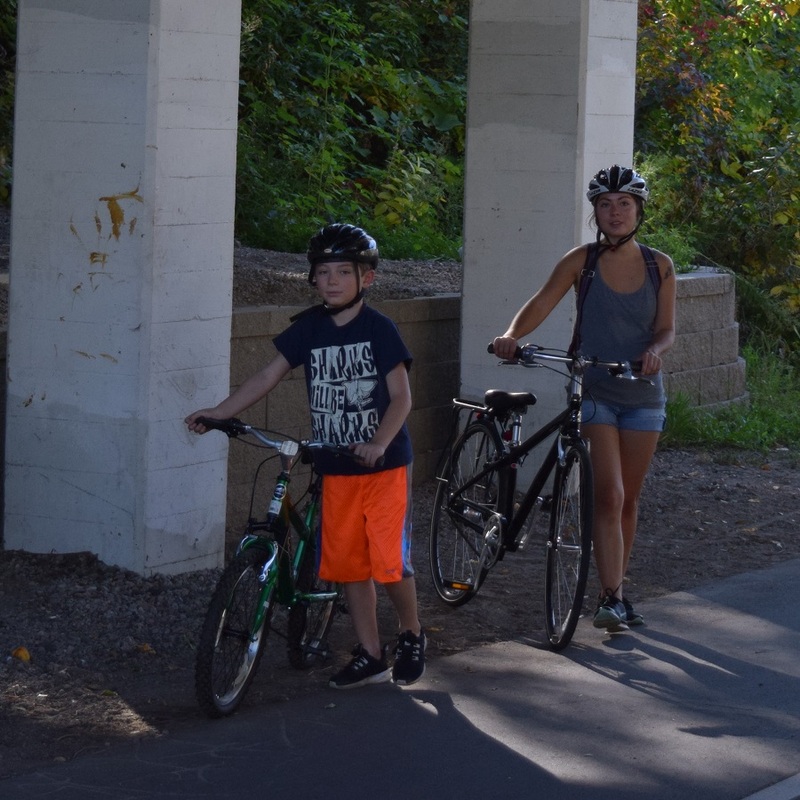 This entry was posted in News and tagged #FindYourNextAdventure, bicycle safety, Biking in Minnesota, MN trails, Mountain Biking on November 18, 2015 by Russ Lowthian. 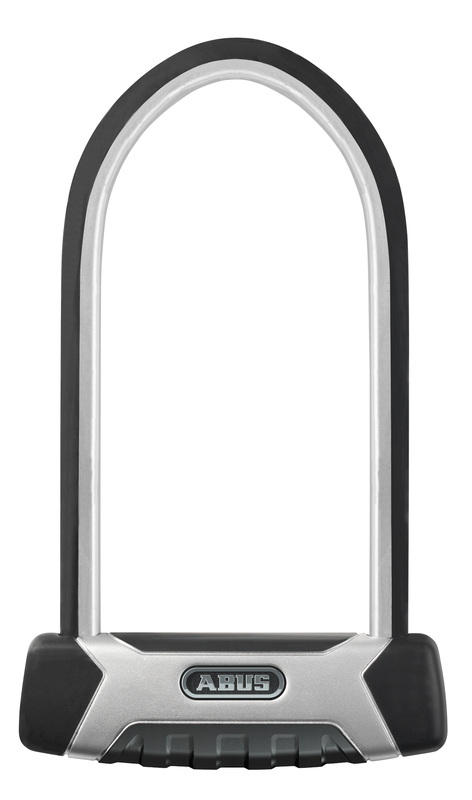 If you are looking for a secure way to attach your cherished investment to a bike rack, fence, or sign post; checkout the ABUS line of U-Locks. Over the past few weeks, I’ve been testing both the Granit X-Plus 540 and the Granit X-Plus U54 Mini. Both U-Locks are somewhat new to the market and as I have found are top of the line and worth the price. My first thought when receiving these locks for review was their weight! The X-Plus 540 weighs 3.20 pounds, while the U54 Mini weighs 2.70 pounds. It could be caused by the “13mm temper hardened steel”, but regardless, these locks are tanks! 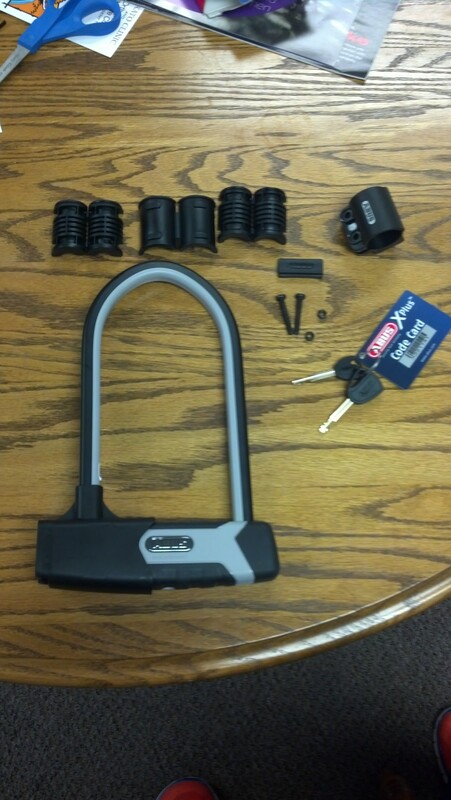 After my review of these bike locks, I wouldn’t feel safe with some of the other U-Locks that I have looked at. They feel light and breakable. The extra weight of these ABUS locks was a small trade off in knowing that when I return to my bike, it will be ready to go. There are a number of different ways in using both these ABUS U-Locks. For me, I found it best to lock the bike through the back tire and bike frame. My front tire was still vulnerable, but the back wheel and frame were secured. I found that the U54 Mini also had a wide enough build, that the back tire and frame could easily be locked, in most cases, like the X-Plus 540 model. If you’re someone that primarily goes on long distance rides, or pedals around on the weekends, I’d suggest purchasing the U54 Mini vs. the Granit X-Plus 540. The primary reason for this is its size; the U54 Mini is smaller and lighter making it easier to transport. 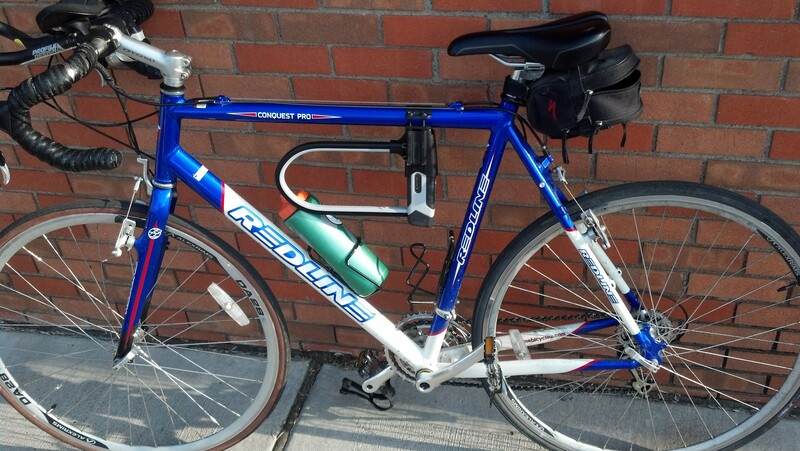 With the Granit X-Plus 540 mounted on my Red Line road bike, I was not able to utilize my second water bottle cage. 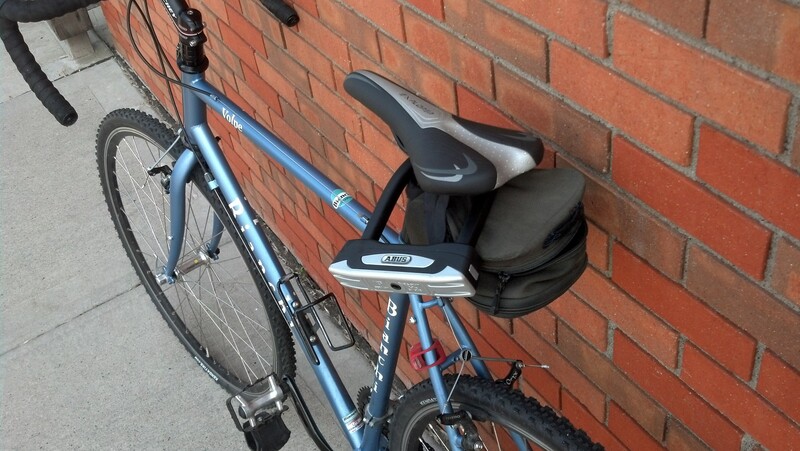 For someone biking long distance, making room for extra water storage will be priority over this mounted U-Lock. However, if theft is a major concern, the Granit X-Plus 540 is the way to go. Both of these ABUS locks come with two sets of keys. What’s nice is both sets of keys have an LED light at the end. This makes it easy to lock/unlock while riding in dark conditions. 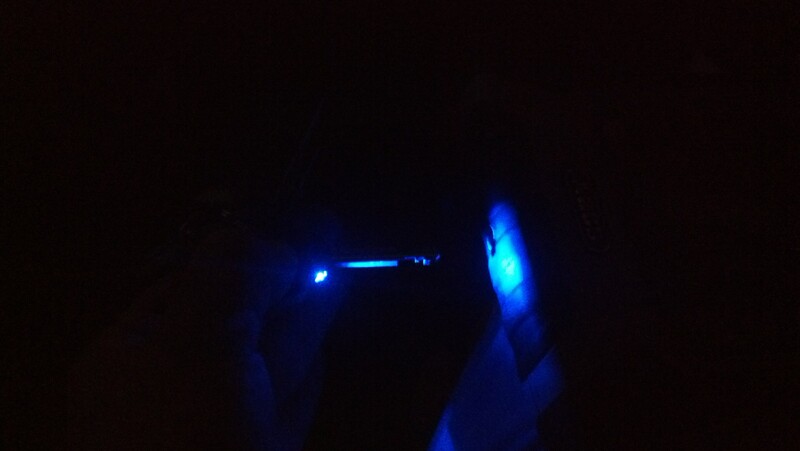 Personally, I’ve used this LED light more as a light on my keychain than just for my bike. The battery is also very easy to exchange. It takes one coin cell battery that just slides out from the back of the key. Along with the keys, a code card comes with these lock. 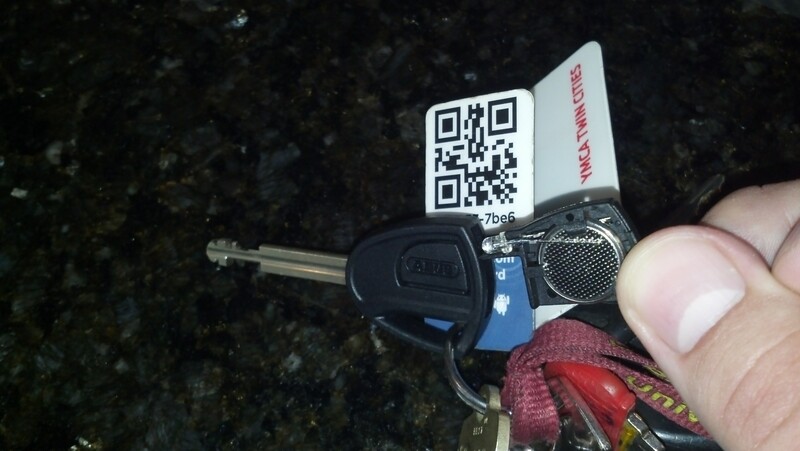 If I were to lose or break both keys, ABUS will be able to make new ones just by receiving the code on the card. All ABUS locks feature industry leading corrosion resistance – perfect for wet, rainy and snowy climates. The keyhole itself has a metal cover that opens from the middle when pushed on by the key. This will secure water and road grime from entering the lock. The X-Plus 540 also included a convenient mounting bracket that could be placed in a number of spots. For me, the best place was right under the top cross bar. Unfortunately, the instructions to this mounting bracket were in German. Looking at the pictures and guessing what parts go where, I ended up mounting the lock and to my surprise, the lock flew off my bike while riding! Luckily there were YouTube videos that walked me through the proper way in mounting this lock. Once this lock is properly mounted (you will have to physically unlock the lock in order to remove it from the mount) it will not fall off your bike. This assures the lock is secured safely on the bike, as a 3 pound lock doesn’t feel too good on the foot! With the X-Plus U54 Mini, there was no mounting bracket, so I had to be creative and search for a place to store it while riding. If you’re someone that carries a backpack or rides with a luggage rack bag or pannier, storing the lock there will be the easiest. Otherwise, I locked it under my bike seat as it was resting on the back seat post bag. The ABUS Granit X-Plus 540 has a 15/15 security rating, and is ideal for urban areas. If you need a secure safeguard when making stops where you have to leave your bike, the X-Plus 540 provides strong protection with a patented 13mm temper hardened steel square, parabolic shackle, and a double bolting shackle/lock body. With its patented ABUS Power Cell technology your bicycle investment will be provided the highest protection against hitting and pulling attacks. Plus, the 540 features the most advanced technology available for lock picking prevention with the X-Plus Key cylinder in a U-Lock. The U54 Mini features the most advanced technology (the same as the U540) but in a short shackle version. 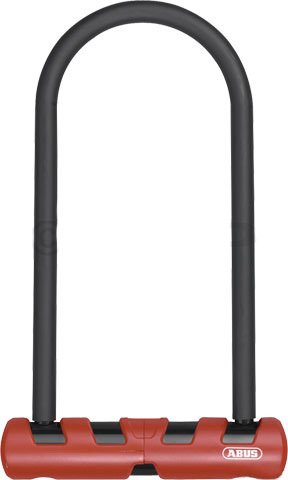 The lock retains the wide profile of its full size siblings in the Granit X-Plus U lock family, making it ideal for use in cities that have reinforced parking meters available for bike parking and where a narrow shackle profile won’t fit. The lock is double bolting, meaning that if any thief attacks the lock with a grinder will have to make two cuts, as opposed to one cut for other brands whose locks are single-bolting. All in all, I’m a fan of these ABUS U-Locks and would suggest purchasing one of these two models. Suggested retail price of the Granit X-Plus 540 is $149.99 for the 9” shackle, and $159.99 for the 11” shackle. Suggested retail price of the Granit X-Plus U54 Mini is $109.00. Yes, they’re heavier and a bit more expensive than many other U-locks on the market, but the trade-off is security. Be sure to visit your local bike shop to find these products to safeguard your bicycle investment! 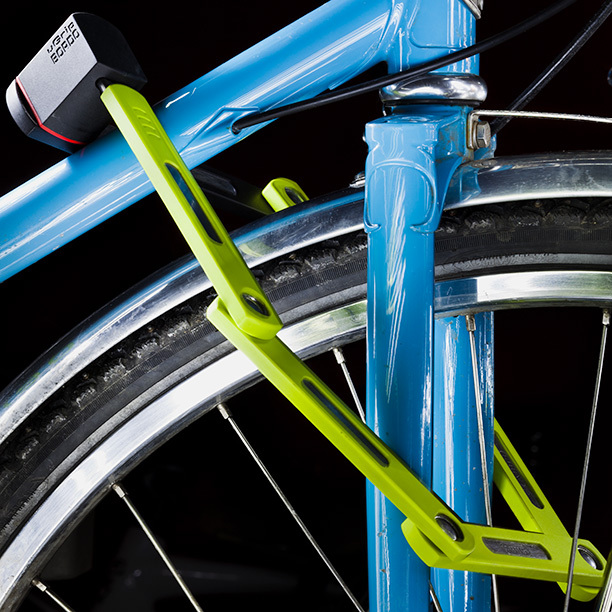 Or, for more on ABUS bike locks, visit: Keeping Your Bicycle Safe With ABUS Bike Locks. 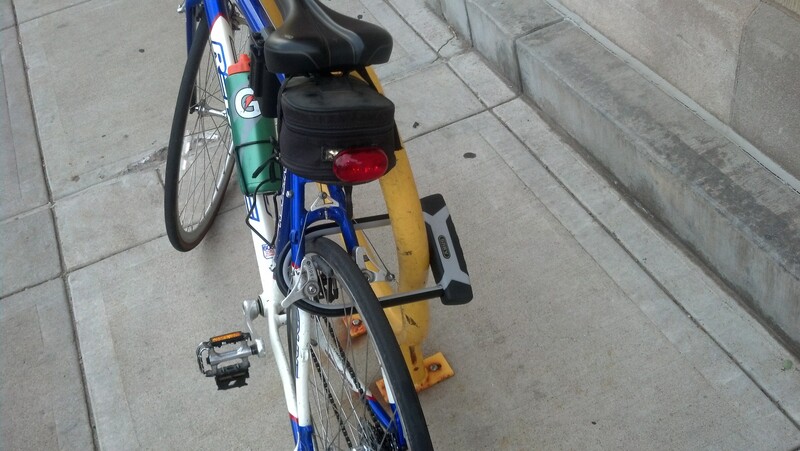 This entry was posted in News, Products and tagged ABUS, bicycle safety, u locks on August 13, 2014 by Russ Lowthian. With thousands of bicycles stolen each year, what are you doing to ensure your bicycle’s safety? The most important aspect of a safe and secured bike is having a reliable bike lock. 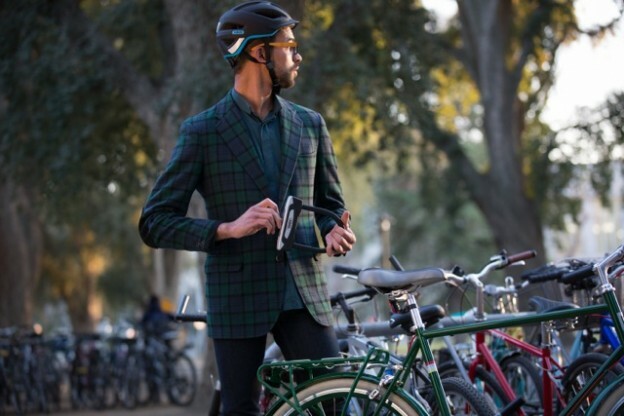 Securely locking it in a well lit – high traffic area and having photo(s) along with your bike’s serial number, and information on where it was purchased on file. 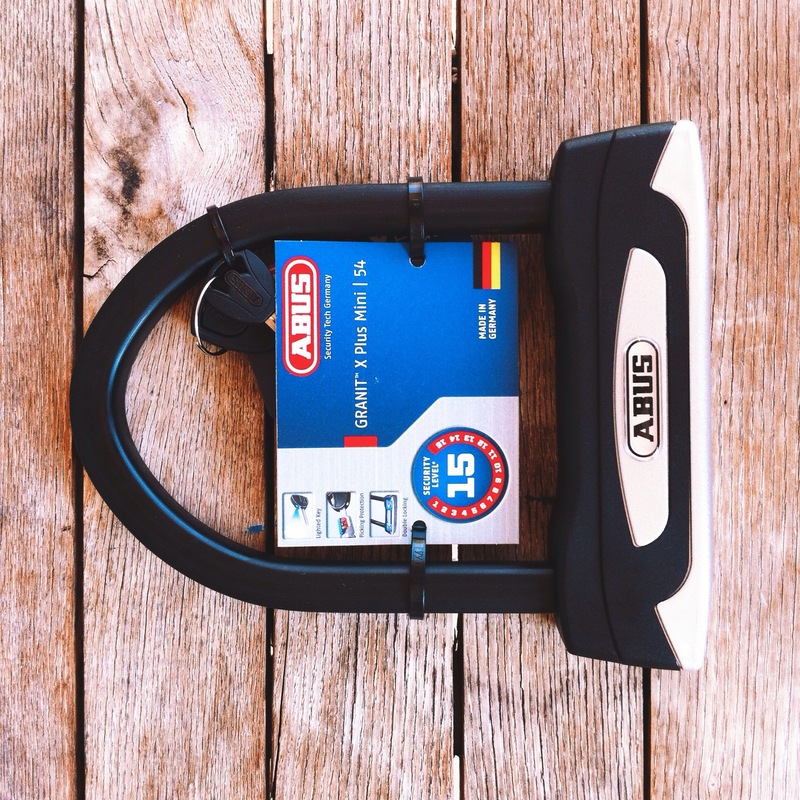 The ABUS Granit X-Plus 540 has a 15/15 security rating, and is ideal for urban areas. If you need protection on high quality bicycles, the 540 provides strong protection with a patented 13mm temper hardened steel square, parabolic shackle, and a double bolting shackle/lock body. With its patented ABUS Power Cell technology providing the highest protection against hitting and pulling attacks, and the X-Plus Key cylinder offering extremely high protection from lock picking- the 540 features the most advanced technology available in a U-Lock. The lock is double bolting, meaning that any thief attacking the lock with a grinder will have to make two cuts, as opposed to one cut for other brands whose locks are single-bolting. Designed in a range of 5 bright colors (black, orange, blue, lime, and pink) the new uGrip Bordo is the perfect locking solution for suburban or low-theft risk locking needs. An updated, rotating lock body and “snap” closure make the uGrip tremendously easy to use. The rattle-free carrying case mounts quickly to the bike by using the provided Velcro straps, or can be screwed directly into the bottle cage mounts, making transportation incredibly easy. A one-touch button frees the lock from its pouch and a color-coded link and lock body make it simpler to identify the locking side of this lock. The uGrip Bordo can also be ordered “keyed” with specific coil cables via special order. Made of high quality, temper hardened steel; the Ultimate 420 has a slightly narrower inner width and lock body than the beefier Super Ultimate. The 14mm shackle double bolts into the lock body for robust protection against cutting and torsion attacks. All ABUS locks feature industry leading corrosion resistance-perfect for wet, rainy, and snowy climates! Check with your local bike shop for these models and other product to safeguard your bicycle investment. It’s also a smart idea to register your bicycle through the Minneapolis Police Department or the city you live in. Then, if your bicycle gets taken, call your local precinct and make a formal report. Be sure to include color, manufacturer, model, serial number, or any other identifiable features. 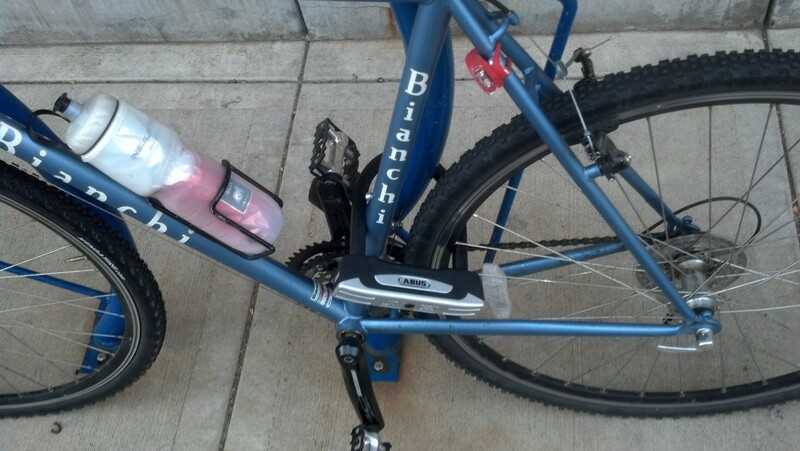 This entry was posted in News, Products and tagged ABUS, bicycle safety, bike lock on June 27, 2014 by Russ Lowthian.